Hello everyone… this is a fanfic I made for a friend. It is a gift I made for her in an activity in another forum. And since I have been making fanfics with JJ as the main character, I have decided to use U-Know since I really seldom make fanfics for him. So now here it goes… Hope that everyone will enjoy this story. “Lenna…Wake up!” an old woman’s voice started echoing throughout the room. Startled, I quickly opened my eyes. Only to see the smiling face of my mother gazing at me. “Mother, what time is it?” I whined as I quickly covered my face with the pillow beside me because the light from the windows was hurting my eyes. “Time? It’s time for you to get up. What time did you sleep again last night? You are spending so much time on the computer lately to the point that you’re neglecting your health. Look at your eyes. It already has dark rings around it. You’re starting to look like you’re sick or something,” my mother started to nag. “Oh mother. . . Don’t worry. I am not sick,” I just uttered. “Get up. I already arranged your breakfast,” my mother said as she quickly left the room. Lenna couldn’t believe what she was seeing. Right in front of her were two precious papers…. a plane ticket and a concert ticket. “Mother? What’s this?” she asked, confused and still unable to believe. Her father and mother both laughed after seeing the expression on her face. “We know how much you want to go to Korea to watch the upcoming DBSK concert. So your father and I decided that for your birthday, we will be fulfilling that wish of yours,” the old woman said with a smile. Joy and excitement quickly registered on Lenna’s face. “Oh! Mother. . . Father . . . thank you so much,” she said as she gave her parents a warm hug. “You’re going to Korea?” Yuki asked. “Yes, I still can’t believe it. I am actually going to see them perform live,” Lenna said with a giggle. “Lucky you. I wish my parents can also give me a plane ticket and a concert ticket for my birthday,” Yuki said with a sigh. “I wish you can come with me. Going there alone isn’t fun at all,” Lenna said with a sudden sadness in her eyes. Lenna slowly nodded and sighed again. Suddenly a feeling of déjà vu quickly entered her mind. “What’s wrong?” Yuki asked with concern after seeing the confused look on her friend’s face. “I suddenly get the feeling that this scene happened already,” she quickly answered. “You’re doing it again. You’re making me shiver already. Anyway have you dreamed about U-Know lately?” Yuki asked as she tried to change the topic. “Yes, last night … I think. But I can’t really remember the details anymore. My mother suddenly woke me up and everything just disappeared before I can actually understand what I was dreaming about,” Lenna replied. Lenna laughed. “Frankly, it’s quite frustrating Yuki. Imagine in your dreams, you’re with someone but when you wake up . . . you suddenly find out that you’re not. Sometimes I just don’t want to sleep anymore. I am already getting tired of those dreams. It is just giving me false hopes of meeting U-Know and being with him,” she said with a sigh. “Oh, I’m sorry that you feel that way,” Yuki uttered. “Well come on, don’t worry about it. A dream is just a dream. 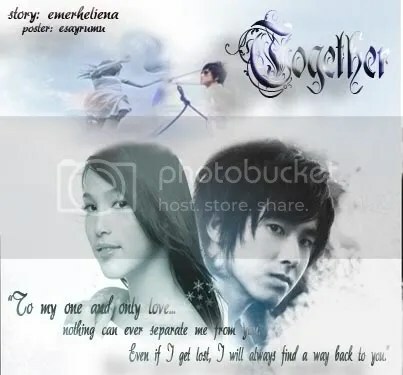 The important thing now is that you’re going to Korea and you’re going to see the DBSK boys live,” she said with a certain glitter in her eyes. Lenna just stared at her friend and smiled. She was already starting to wonder what will happen next. — The day of arrival finally came…..
Lenna took a deep breath as she then slowly looked around the place. She was already in Korea … inside the hotel room that her mother also arranged for her… She was staring outside of the window … wondering what to do next. “Why do I feel so strange?” she started to ask herself. “I know I should be happy that I am finally here but . . . why? I feel like I am not satisfied. I feel like something is still missing,” she uttered as she silently stared at a single star that was visible in the sky. U-Know kept on staring at a star that was all alone in the big dark sky. “You poor thing. You’re all alone tonight. Where are your friends?” he uttered, as if talking to the star. “Hey, what are you looking at?” Xiah asked as she suddenly just appeared right behind U-Know. “Uhmm, nothing. Just a lonely star,” U-Know answered. Puzzled, Xiah also stared at the sky. Then he smiled. “You’re being weird again. What’s wrong? You had a dream again, didn’t you?” he suddenly said to his friend as he faced him. U-Know nodded. “I really can’t get the girl’s face out of my mind. It’s starting to bother me,” he answered. Xiah just kept silent. Somehow he was lost with words. He really didn’t know what to say to his friend. He knew that U-Know had been dreaming about a girl for the passed year and it was already bothering him in his daily life. Lenna was happily strolling down the street. She had decided to go window shopping and also try to eat some of the local foods she had read about. She was very excited to go out and explore. She had been in Korea for almost two days and she was already bored. The DBSK concert was still several hours away so she decided to have a look around first before actually heading to the place where the concert was supposed to be held. She was looking at one store to another. She had already bought some small souvenirs that she had placed safely in her bag. Suddenly something caught her attention. She started to look at a store. It was a bookstore that sells old books. Somehow the place looked familiar. She just kept on staring and staring, wondering what to do next. U-Know was silently staring out of the window of their van. They were already going to the place where their next concert was going to be held. He was about to look away when his heart quickly started to beat very fast and hard. He couldn’t believe his eyes. He just saw the girl in his dreams. “Stop the van!” he quickly shouted to the driver. Startled, the driver immediately stopped. The other DBSK members were all surprised with their leader’s action. U-Know quickly got out of the van and went straight to where he had seen the girl. But as soon as he reached the exact spot where he saw her, she was already gone. He tried to look around. But the girl was nowhere in sight. He then looked at the store in front of him, it was a store that sold old books. He was about to go inside when a group of girls suddenly blocked his way. “Oppa, please sign this,” one of the girl’s said excitedly as she tried to give him a paper and a pen. U-Know didn’t know what to do. He sighed and just took the paper and started to sign. More and more girls started to form around U-Know. They were all screaming and shouting his name. Just a few more minutes passed and U-Know was already being safely escorted back to their van. And as he sat down, and stared outside of their van… he could feel his heart beating wildly. Somehow he wanted to go back and take a look inside the store. He wanted to see …. Maybe the girl he was searching for was there. But he knew he couldn’t do it now. Not with all the fans already screaming and banging outside their van. As their van started to move away, U-Know’s heart sank down to its lowest point. He could feel his heart was crying. And even if he didn’t want to go, he knew he had no choice. Lenna happily stepped out of the store. She had just bought a book that she found very interesting. It was an English book that told a love story about two lovers who were separated and eventually found each other after years of being apart. The story intrigued her. Somehow something about the story caught her attention. The book was already old, but she didn’t care. She liked the story and it was all that mattered. As she started to look around, she noticed a group of young girls screaming and shouting not far from where she was standing. Then she noticed a black van that was slowly moving away. Instanly, she felt strange. Somehow she couldn’t explain the sadness that filled her soul. Lenna tried to put on a smile. She should be happy, she told herself. She found a good book and she was going to a DBSK concert in a few hours. She tried to brush off the weird feeling she was having and just started to think about where to go next. And as she slowly moved away from the store, a cold wind quickly passed by. “Dong Bang Shin Ki! Dong Bang Shin Ki!” the crowd screamed, shouted and chanted. Lenna had been waiting patiently for the concert to start. She was very excited. She was finally going to see the DBSK boys perform live in front of her eyes. And she was finally going to see U-Know in real life. Suddenly her heart skipped a beat after thinking about him. Maybe if he saw her…. Maybe … Maybe…. She quickly tried to stop herself from daydreaming. She was just going to make a fool of herself, she uttered in her mind. As soon as the concert started, Lenna could feel her ears were going to explode from all the shouting and screaming she was hearing. But she didn’t care… The DBSK boys were already on stage and were already performing. She couldn’t explain the happiness she was feeling. As she stared closely at U-Know, it was as if her heart had suddenly stopped. U-Know was already having a good time singing and performing for all their fans. Somehow the screams and shouts were adding more energy to their performance. And as they started to sing their next song, he then started to move around. He was already singing his part when…..
“It’s her!” both his heart and mind screamed after seeing the girl in the crowd. She was also staring at him. And as their eyes met, he instantly felt the connection. She was the one he had been dreaming of. Then suddenly he remembered something. He had already dreamt of that exact moment. He already had a dream of meeting her in a concert. And the scene in his dream was exactly the same. The other DBSK members quickly noticed that U-Know had suddenly stopped singing. So Xiah immediately covered up with an adlib to make up for their leader. And as the other DBSK members continued to sing, U-Know just froze in front of Lenna. Some of the fans were already noticing the exchange of looks between Lenna and U-Know. Some of them were already asking who Lenna was and why U-Know was staring at her. Micky quickly tapped U-Know on the shoulder as if to wake him up from his shocked state. Within seconds, U-Know regained his consciousness and continued to perform. And as soon as the DBSK boys changed their clothes again, U-Know immediately instructed one of their body guards to look for the girl he had seen in the crowd. He had also asked their body guard to keep an eye on her and try to bring the girl to him after the concert was over. The other DBSK boys were all puzzled. But they just kept silent since they were all busy and had no time to ask questions. After the concert, Lenna quickly slipped away from the crowd. Somehow her head was starting to ache from all the screams, shouts and loud sound in the concert. She wanted to go and rest already. She was feeling very dizzy and staying there was making her feel more sick. “She had suddenly disappeared after the crowd started leaving. I wasn’t able to follow her because she slipped through a large group of people,” the boys’ body guard explained. Frustrated, U-Know just turned away immediately and started mumbling to himself. The other DBSK boys just continued to observe what was happening. Somehow they didn’t want to intrude in U-Know’s private affairs. Lenna continued to walk back to the hotel she was staying in. She just wanted to walk. She didn’t know why. But it was as if she felt so at happy with staring at things, here and there. Then she suddenly noticed that she was already standing in front of the bookstore that she had entered a few hours ago. “Strange, why am I here again?” she asked herself. Again, Lenna stared at the store. She was trying to decide whether to enter again or not. Then she remembered the book that she bought. She then noticed that somehow her bag had gotten lighter. Hurriedly, she opened her bag to search for the book she bought. As soon as she saw it, she quickly took it out. Lenna sighed with relief, then smiled. Her book was safe. She was flipping through the pages when a picture slipped and fell on the ground. Surprised, she quickly bent down to pick it up, but before she could reach for it … another person had already taken hold of it. Lenna slowly looked at the man who was holding the picture in his hand. And the moment their eyes met, her heart had instantly stopped beating. U-Know couldn’t believe what he was seeing. The girl in his dreams was real. She was now standing in front of him… with her long black hair flowing so lightly as the cold wind blew… her beautiful face with the perfect shaped lips and sparkling eyes… her slender and perfect figure … and the most captivating smile that instantly took his breath away. Everything about her was perfect. U-Know tried to smile even though he was feeling very nervous. “I believe … this is yours,” he said as he handed her the picture. Lenna smiled shyly. “Thank you,” she uttered as she nervously tried to reach for the picture that was being handed to her. Unexpectedly… their hands touched. And instantly they felt something so familiar… something that was holding them together. U-Know quickly took hold of Lenna’s hand. Somehow he didn’t want to ever let go. He knew he was never going to have another chance to hold her hand, and he certainly didn’t want to pass up the chance. Lenna stared at U-Know’s hand as it gently held her hand. Then she stared more closely at his face. He was also staring at her. At that exact moment, the world had stopped. Both U-Know and Lenna couldn’t deny the strong connection that they were feeling. “Can I … invite you to dinner?” U-Know boldly asked. Somehow his eyes were begging her to say yes. Lenna smiled, then without any hesitation nodded. A sweet smile quickly appeared on U-Know’s lips. He knew this was a start of something … so beautiful. They were already in the van when Lenna remembered the picture. She hurriedly took it out again and stared at it. “What? How?” she uttered. She couldn’t believe what she was seeing. Shocked and puzzled, she handed the picture to U-Know. And just like her, he was also taken by surprise. A young girl that looked exactly like Lenna and a young man that also resembled U-Know were in the picture. It was a wedding picture. The picture was already old so there was no doubt that it was taken before they were born. U-Know slowly looked at the back of the picture. A small note was written on it.